The FX16 offers a combination of powerful live and recording features, with enough channels and direct outputs to enable use with 16-track recording systems. 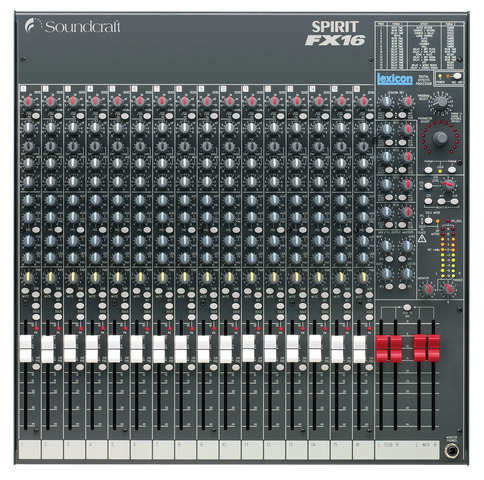 Spirit FX16 is a flexible 4-bus mixer capable of producing Digital sound quality for live and recording applications. It features a specially designed 16 program Lexicon Effects Section with dual effect capability (including Chorus and Reverb, Chorus and Delay , and Reverb and Delay) and fully editable and storable programs and parameters. The console itself includes 16 mic/line inputs and 26 inputs to mix in total (including FX returns and tape return to mix). In addition to the mix outs, two sub-buses allow groups of instruments to be sent to multitrack, to additional speakers, or sub-grouped to mix. FX16's 16 Direct Outs are individually fader pre-post switchable so they are equally useful for recording in the studio or at a gig. In keeping with the multipurpose nature of FX16, both Solo In Place and PFL solo are available, for studio monitoring and channel gain set-up applications respectively. All FX16's 16 mic/line inputs are equipped with UltraMic™ preamp which provides a full 60dB of gain range and +22dBu of headroom, meaning that the FX16 input stage can handle virtually any mic or line device. In the EQ section, a "truly British 3-band EQ" with swept mid benefits from custom designed pots which give greater control across carefully chosen frequencies. There are 4 Auxiliary Sends, including a dedicated Lexicon effects send, 1 pre-fade send and 2 pre/post-fader selectable send which are equally useful as extra foldback send in monitor-heavy live applications, or as effects sends in studio mixdown situations. In addition, there are four Stereo returns, a separate Mono Sum Output and 2 Subgroup Outputs. 100mm faders are used throughout, giving more accurate control during complex mixes than standard 60mm designs, and all pots have been custom designed to give even and consistent response around their entire sweep. The use of the latest PCB surface mount technology means that FX16 fits all of these features into a rugged, compact frame which can be optionally rack-mounted into a 10U space via FX16's rotating connector pod which allows leads to be connected conveniently behind the rack.